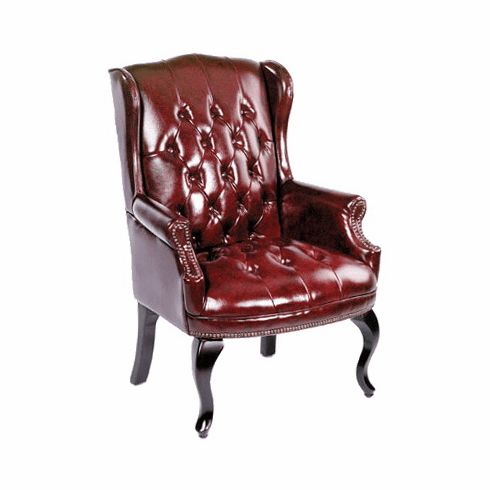 Traditional Queen Anne Style Chair by Boss [B809] Free Shipping! An elegant chair with classic traditional styling and charm. Features include your choice of either rich oxblood vinyl or classic caressoft black vinyl upholstery, thickly padded seat and backrest cushions, padded armrests, button tufting on both the seat and back, hand applied brass tack trim lines the front of the chair and around the front of the arms and a solid wood frame with solid wood antique styled legs in a rich mahogany finish. Meets or exceeds ANSI/BIFMA standards. Matching traditional loveseat and sofa also available. Dimensions: Seat Size: 23"W x 20"D. Back Size: 20"W x 26"H. Seat height: 19"H. Six year limited warranty from Boss. This chair normally ships within 2-3 business days from our GA or CA warehouse. *Ships by tractor trailer due to the size. Customer will need to unload the chair from the tailgate of the truck. Inside delivery is available as an option.